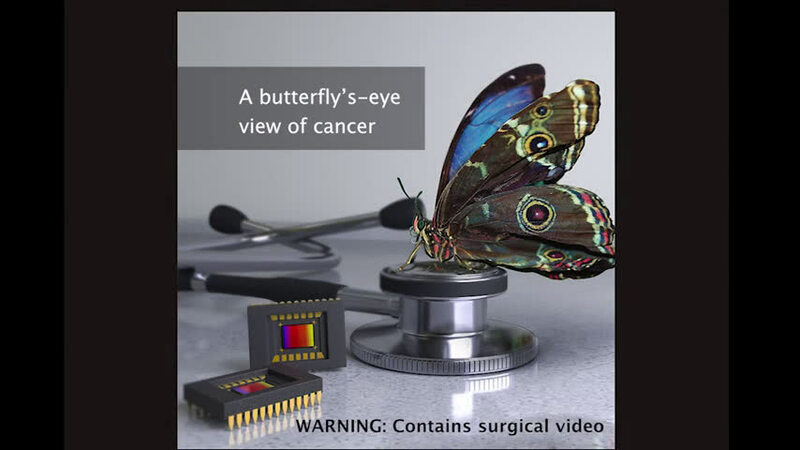 By mimicking the intricate visual system of a butterfly, researchers have created a camera that provides surgeons with both a traditional color image as well as a near-infrared image that makes fluorescently labeled cancerous cells visible even under bright surgical lighting. The new camera is designed to help surgeons remove all the cancerous cells without damaging healthy tissue, making it less likely that the cancer will spread and reducing the need for multiple surgeries. "Instead of putting together commercially available optics and sensors to build a camera for image-guided surgery, we looked to nature's visual systems for inspiration," said research team leader Viktor Gruev from the University of Illinois at Urbana-Champaign. 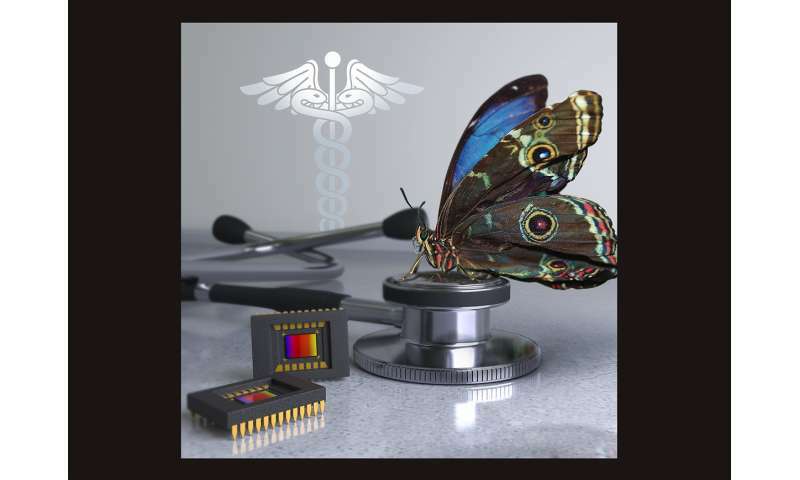 "The morpho butterfly, whose eyes contain nanostructures that sense multispectral information, can acquire both near-infrared and color information simultaneously." In Optica, The Optical Society's journal for high impact research, the researchers demonstrate that their bioinspired camera can detect tumors in animals and is useful for assessing the stage of breast cancer in people. The new camera offers very sensitive fluorescence detection even under standard operating room lighting, weighs less than an AA battery, and can be manufactured for around $20. "During surgery, it is imperative that all the cancerous tissue is removed, and we've created an imaging platform that could help surgeons do this in any hospital around the world because it is small, compact and inexpensive," said Gruev. "Although we've addressed the instrumentation side, fluorescent markers targeted for cancer and approved for use in people are needed for our technology to find widespread application. Several of these are in clinical trials now, so we should see progress in this area soon." The new camera greatly improves upon today's cameras that are approved by the U.S. Food and Drug Administration (FDA) for viewing fluorescent markers during surgery. Many existing near-infrared cameras lack the sensitivity to detect fluorescence markers under surgical settings, so the room lights must be dimmed to view the fluorescence. Another problem with today's infrared imagers is that the fluorescence image is not always precisely aligned, or coregistered, with the tissue it arises from. This happens because FDA- approved instruments use multiple optical elements, such as beam splitters and relay lenses, to separate the visible and infrared wavelengths, so that each can be sent to separate detectors. Slight temperature changes in the room can affect the optics in these instruments causing image misalignments that could cause a surgeon to miss cancerous tissue while unnecessarily removing healthy issue. 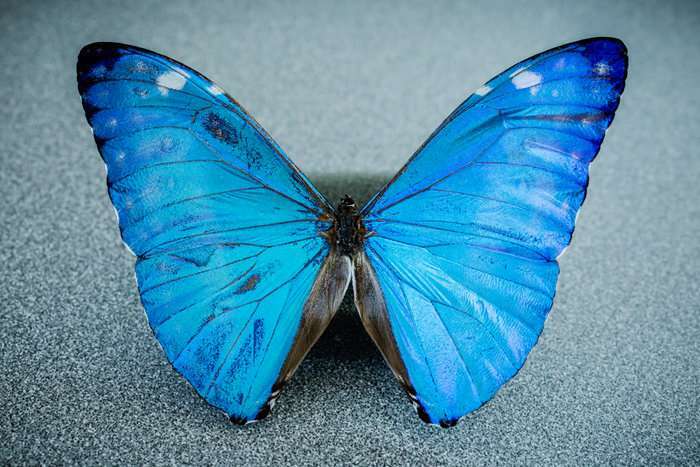 "We realized that the problems of today's infrared imagers could be mitigated by using nanostructures similar to those in the morpho butterfly," said Missael Garcia, a post-doctoral researcher at University of Illinois at Urbana-Champaign and lead author of the paper. "Their compound eyes contain photoreceptors located next to each other such that each photoreceptor senses different wavelengths of light in a way that is intrinsically coregistered." The new camera uses a setup similar to the butterfly eye by interlacing various nanoscale structures with an array of photodetectors, enabling collection of color and near-infrared fluorescence information on one imaging device. Integrating the detector and imaging optics into a single monolithic sensor keeps the device small, inexpensive and insensitive to temperature changes. The design uniquely solves the sensitivity problem by allowing each pixel to take in the number of photons needed to build up an image. It doesn't take long to create the visual-wavelength image for viewing the anatomy since the visible illumination in the lab is high. On the other hand, because fluorescence is typically dim, it takes longer to collect a sufficient number of photons to build up a sufficiently bright image. By changing the exposure time to allow each pixel to detect the photons it needs, a bright fluorescence image can be created without overexposing the color image of the tissue. The researchers tested their new instrument on a mouse model that develops spontaneous breast cancer. This means that the exact location where the cancer will grow is unknown as is the number of cancer cells. Using fluorescent labels that bind to cancer cells, the researchers showed that their bioinspired imager enabled tumor detection with an accuracy and sensitivity surpassing state-of-the-art infrared cameras FDA-approved for image-guided surgery. The researchers also tested the ability of their infrared camera to identify lymph nodes in 11 patients with breast cancer at Washington University School of Medicine in St. Louis. Because the lymph nodes are one of the primary places where breast cancer spreads, surgeons check them to determine the cancer stage. 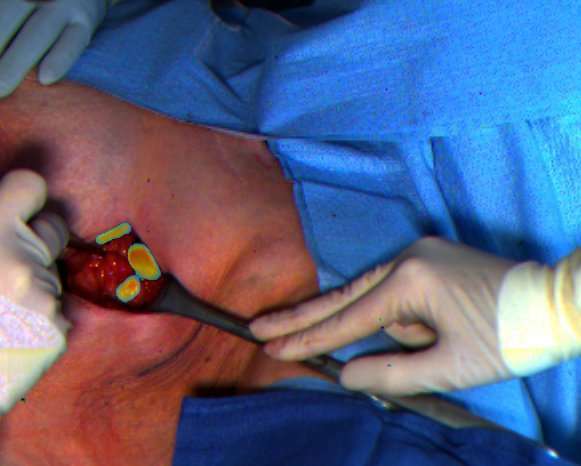 The patients were injected with FDA-approved indocyanine green fluorescent dye that accumulates passively in the lymph nodes and then fluorescence images from the bioinspired imager were displayed either on a screen or projected onto goggles worn by the surgeons. "We showed that under bright surgical lights, our instrument was 1000 times more sensitive to fluorescence than the imagers currently approved for infrared image-guided surgery," said Gruev. "Because the bioinspired imager can reveal fluorescence that is deep in the tissue, it sped up the process of lymph node identification and helped surgeons find lymph nodes that couldn't be seen by eyesight alone." According to the researchers, the bioinspired imager would be useful for removing various types of cancers, including melanomas, prostate cancer and head and neck cancers. Because of its small size it could also be integrated into an endoscope to look for cancer during a colonoscopy, for example. "One big advantage of our instrument is its compact size," said Garcia. "We tested our instrument in a hospital where space was tight and saw that it didn't intrude on the surgical workflow." The researchers are now forming a start-up company to commercialize their bioinspired imager and are also working with the FDA to design a clinical trial in which the surgeons can compare clinical decisions made with the new imager with those that would be made with FDA-approved imagers.